A new report by Oil Change International (OCI) and the Overseas Development Institute (ODI) discovers that the G20 governments’ exploration subsidies marry bad economics with potentially disastrous consequences for climate change. In effect, governments are propping up the development of oil, gas and coal reserves that cannot be exploited if the world is to avoid dangerous climate change. 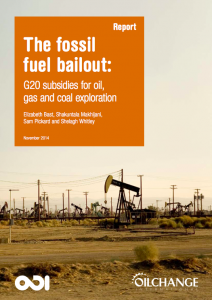 Furthermore findings in ‘The Fossil Fuel Bailout: G20 Subsidies for Oil, Gas and Coal Exploration’ show that by providing subsidies for fossil-fuel exploration, the G20 countries are creating a ‘triple-lose’ scenario. They are directing large volumes of finance into high-carbon assets that cannot be exploited without catastrophic climate effects. They are diverting investment from economic low-carbon alternatives such as solar, wind and hydro-power. And they are undermining the prospects for an ambitious climate deal in 2015. Governments across the G20 countries are estimated to be spending $88 billion every year subsidising exploration for fossil fuels. This report documents, for the first time, the scale and structure of fossil fuel exploration subsidies in the G20 countries. The evidence points to a publicly financed bailout for carbon-intensive companies, and support for uneconomic investments that could drive the planet far beyond the internationally agreed target of limiting global temperature increases to no more than 2ºC. Overseas Development Institute is the UK’s leading independent think tank on international development and humanitarian issues. harnessing polyhydroxyalkanoate production by non-pathogenic plant-associated bacteria (for petroleum alternatives) and pectinolytic activities of naturally occurring water retting bacteria for hemp bast fiber production (paper and UK naval wooden ship sails and rigging, e.g., canvas is from the word cannabis) are only two of many possibilities. I love you, and it scares me to death, but WHY DON’T YOU GET THIS OUT INTO THE WORLD? Roberta we actually got pretty good press on this report: BBC World, Guardian, Reuters and others. But we’ll keep trying through mainstream media and other avenues until folks understand this. Because you are an advocacy organization, I am asking how much of this information comes from journalistic methods. I have been reading refutations that oil and gas industries are being bailed out, getting subsidies, public gifts, etc., again by people who have an agenda. They claim the mainstream media are not picking up their “truth” because they go lock-step with Obama and his “truth.” Journalists don’t do agendas so I am asking if you can prove there is journalistic integrity in what you are reporting. Thank you. Diana – read the report here ( http://priceofoil.org/content/uploads/2014/07/OCI_US_FF_Subsidies_Final_Screen.pdf ), and judge for yourself. Everything is carefully referenced to sources like the OMB. I live in clean, green New Zealand, in the most remote and beautiful place on the West Coast. In the last four years our Government has endowed us with a coal mine above us, a coal stockpile beside us, a 24/7 engineering workshop allowed to sandblast outside 24/7 and a gold mine less than 2km away. Now they are also encouraging a new coal mine in our town’s water reserve. Our local council is determinedly protecting mining companies from complaints by residents. There seems to be no limit to corporate cynicism and dumbness!